AntPro ant bait stations are highly durable, rugged delivery devices, that when combined with any one of several low-toxicity liquid ant baits, provides consistent long-term ant control. The stations are refillable and will provide years of dependable service when maintained correctly. When the AntPro unit is filled with liquid ant bait and activated, a small quantity of bait is released into a pool. As ants consume the bait, liquid tension ducts allow the pool to be replenished automatically. TheAntPro dispenser offers full 360 degree access to the feeding pool. The gravity feed reservoir provides enough bait to feed and eliminate several ant colonies simultaneously over a long period of time. Also, more than one species of ant will forage at the stations. Many times, I have seen thief ants feed while fire ants were present. I have returned to the very same station at night and observed carpenter ants indulging themselves. The AntPro ant control system is weather tolerant and is also tamper resistant. It comes with an attachable stake to secure it to earth surfaces when applicable. To activate it simply rotate the bulb one half turn while holding the base ramp in place. To deactivate and move AntPro to a new location, rotate the bulb back to the original position. 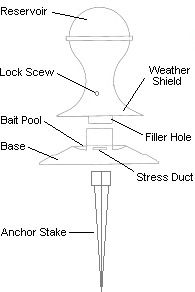 When the unit is in the closed or activated position, a locking screw secures it from tampering. When the AntProSystem, with liquid ant bait, is left in place, it will prevent re-infestations from occurring. In Agricultural applications, large areas can be treated with AntPro, using liquid ant baits, without having to spread pesticides on crops and pastures where livestock live and graze. Orchards and harvesting areas will be much safer for workers. The cost of control for carpenter ants, fire ants, argentine ants, white footed ants and many other species of ant is greatly reduced. Simply place AntPro ant bait stations where they are needed and let them do their job. In Home, Office & Garden applications, AntPro will get rid of ants and other insects from around your home and yard, and provide a barrier to re-infestation. AntPro ant bait stations will eliminate ant colonies for moderately infested areas without refill. Since these stations are exceptionally durable, they can be refilled, when necessary, and used over an extended period of time.